October 31, 2016 – Arctic sea ice, the vast sheath of frozen seawater floating on the Arctic Ocean and its neighboring seas, has been hit with a double whammy over the past decades: as its extent shrunk, the oldest and thickest ice has either thinned or melted away, leaving the sea ice cap more vulnerable to the warming ocean and atmosphere. Direct measurements of sea ice thickness are sporadic and incomplete across the Arctic, so scientists have developed estimates of sea ice age and tracked their evolution from 1984 to the present. 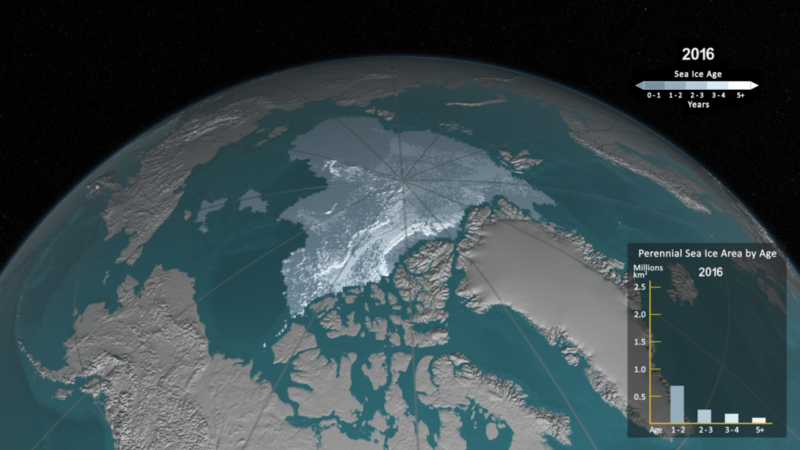 Now, a new NASA visualization of the age of Arctic sea ice shows how sea ice has been growing and shrinking, spinning, melting in place and drifting out of the Arctic for the past three decades. In the early 2000s, scientists at the University of Colorado developed a way to monitor Arctic sea ice movement and the evolution of its age by using data from a variety of sources, but primarily satellite passive microwave instruments. These instruments gauge brightness temperature: a measure of the microwave energy emitted by sea ice that is influenced by the ice’s temperature, salinity, surface texture and the layer of snow on top of the sea ice. Each floe of sea ice has a characteristic brightness temperature, so the researchers developed an approach that would identify and track ice floes in successive passive microwave images as they moved across the Arctic. The system also uses information from drifting buoys as well as weather data. “It’s like bookkeeping; we’re keeping track of sea ice as it moves around, up until it melts in place or leaves the Arctic,” said Meier, who is a collaborator of the group at the University of Colorado and the National Snow and Ice Data Center in Boulder, Colorado, the center that currently maintains the Arctic sea ice age data. Every year, sea ice forms in the winter and melts in the summer. The sea ice that survives the melt season thickens with each passing year: newly formed ice grows to about 3 to 7 feet of thickness during its first year, while multi-year ice (sea ice that has survived several melt seasons) is about 10 to 13 feet thick. The older and thicker ice is more resistant to melt and less likely to get pushed around by winds or broken up by waves or storms. Arctic sea ice has not only been shrinking in surface area in recent years, it’s becoming younger and thinner as well. 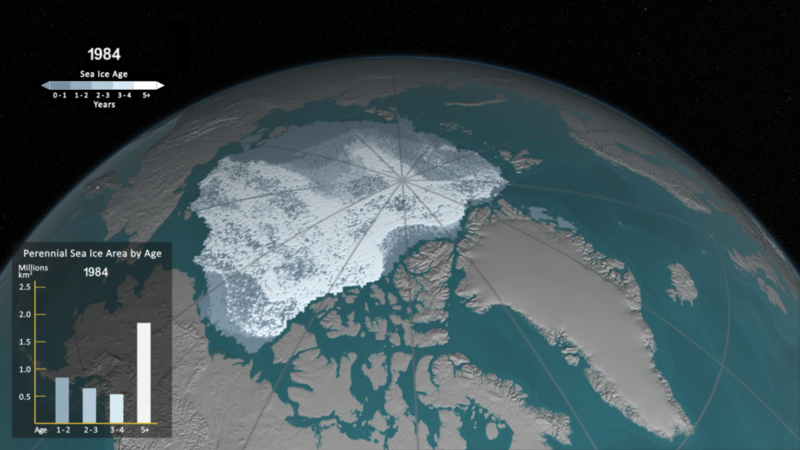 In this animation, where the ice cover almost looks gelatinous as it pulses through the seasons, cryospheric scientist Meier describes how the sea ice has undergone fundamental changes during the era of satellite measurements. The new animation shows two main bursts of thick ice loss: the first one, starting in 1989 and lasting a few years, was due to a switch in the Arctic Oscillation, an atmospheric circulation pattern, which shrunk the Beaufort Gyre and enhanced the Transpolar Drift Stream, flushing more sea ice than usual out of the Arctic. The second peak in ice loss started in the mid-2000s.